As I knew I was going to travel to Romania, I originally wanted to explore something that is generally misconceived as being Italian. 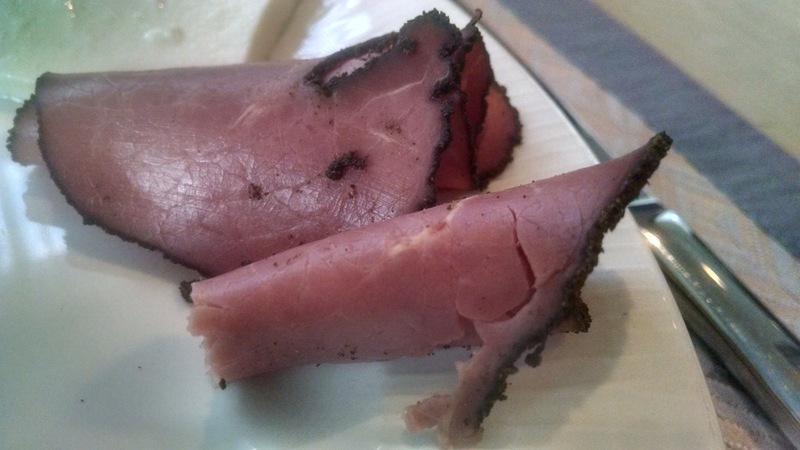 However, when tracing back the origins of this very appreciated type of cold cut, it turns out that most cooking historians point to Romania as being the first to document the Pastrami. Now in the USA, it has been raised to a cult level, and become a classic sandwich. I realized that finding the local cult version is not as easy, as this type of meat is very much tradition based, and is not the subject of as much adoration as you would find in New York delis. Indeed, you can find the classic beef pastrami, but you also find the original variations made from pork, chicken, duck, and goose. 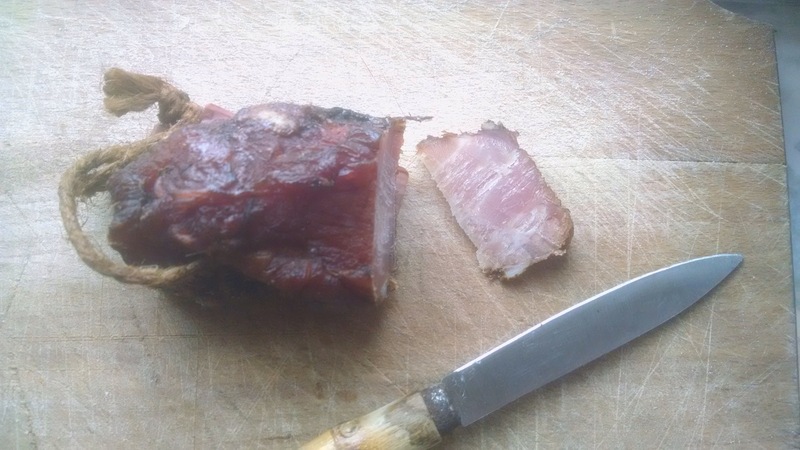 It is a great cold cut, that will keep for a quite a while; as it is first boiled, then cooked, then smoked, as well as being coated with a layer of pepper or herb mix. You then end up with a nice cured piece of meat, which can easily dry age. Since it was the Orthodox Easter, I was suddenly distracted by another great meal, namely the Drob de Miel, or the Romanian lamb haggis. Depending on the region, you will find small variations on the recipe, but one thing for sure is that it is eaten primarily at Easter. The reason for this is simple, as it packs in all the flavours of spring, the fresh young herbs and yes, the lamb. 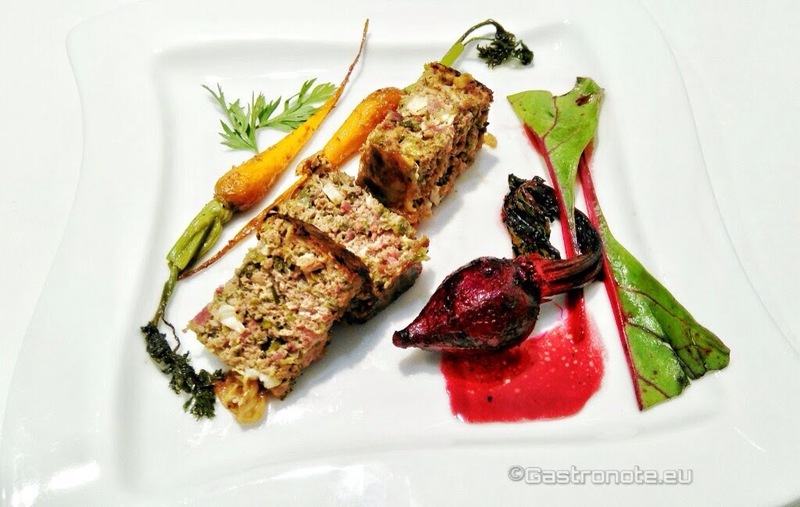 This wonderful dish reminds me a bit of the Scottish Haggis, but without the grains in it. 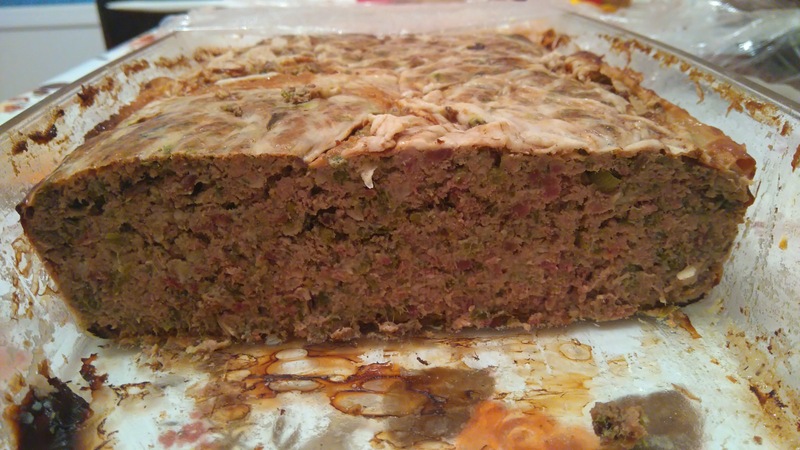 It is prepared with the offals, or organs, of a lamb, mixed with herbs, egg, and covered in a nice wrap of caul fat* before being roasted like a meatloaf. *the caul fat is the thin fatty membrane which wraps around the stomach and internal organs of animals, such as cows, sheep, and pigs. When preparing this dish, it is important to start with a good washing and rinsing of the organs, to remove any residual “earthy” tastes. Usually this can be done by soaking the trimmed pieces in a vinegar-water solution (1-3) for a while. Then of course another rinse, and boiling whilst skimming the froth. If you have the chance to pick some fresh young spring onions, garlic, dill and lovage (or maggikraut), then you will truly impart the flavours of spring into your drob. As mentioned, different regions and families might have some variations on preparing it. For example, some people add whole boiled eggs in the middle, others just gently blend the eggs in. For a more rustic feel the trimmings are roughly chopped, for a more terrine or paté consistency some grind it down. Some first pan fry the trimmed organs to give a roast aroma, others just par-boil them before putting it in the oven. Again, here I will not say you should do this or that version, as it really comes down to taste your personal preference. The important thing is that you find the balance that suits you and reminds you of strolling in the countryside during a nice blooming spring afternoon. So, let’s get down to the preparation. The variant I will tell you was my favourite, after having tried five different types. Fair enough, it was also my preferred one, because I know the garden where the herbs were picked, in the little countryside village of Saucesti in the Bacău county of Romania. This one was also a bit rougher chopped like a fine terrine, a beautifully marbled with the fresh herbs. Trim off connective tissues and wash the organs. Cut them into larger chunks and soak them in just enough vinegar-water solution to cover for a good quarter of an hour. Drain them well and put into a deep pan and cover with cold water. Soak the caul fat in cold water for about an hour, changing the water occasionally. Bring the water with the organs in it to the boil and simmer for about 20 minutes. Skim off the froth that forms at the first boil. As soon as the meat is ready, drain it and leave to cool for 10 minutes. In the meantime, sauté the finely chopped onions with the garlic with tiny cubes of the smoked lard. Chop up all the greenery that you collected – lovage, dill, wild garlic, etc. (fresh from the garden or store). Beat the eggs together and set aside. When the meat has cooled a bit, you can now fry them in a separate pan, to give them a pre-roasting flavor. Cool them enough to handle and then chop them up or run them through the wide-gauge mincer for a finer paté. In my opinion, the hand chopping gives a bit more of an authentic rustic feel to it. Place mixture into a large bowl, the sautéed onion, the chopped herbs, and salt and pepper. Mix these thoroughly and then slowly mix in the beaten eggs, without getting to much of a paste, but a rough mixture. For preparing the recipient, a tin or glass dish, grease all the sides of the recipient thoroughly with the lard or butter. Make sure that the caul lays down, with enough hanging over the sides. You will fold it over the top once filled. If you don’t have enough caul, sprinkle it with breadcrumbs on the buttered sides. Fill the recipient with the mixture and press it down. Lay the remaining caul on top and smear on a little more butter or lard on top. Place the drob into a pre-heated oven at a medium-high temperature (about 190-200C) for about 30-40 minutes or until it looks roasted and crispy on the outside. For the binus tip, I p,ated this wonderful Drob with butter sautéed baby carots and small beetroot. Slowly done with lots of butter, pinch of salt, two of sugar, and a spoon of balsamic vinegar.